The universe is incredibly vast, but where exactly is the center? It turns out there is none. Looking up at a clear night sky, you see stars in every direction. It almost feels as if you're at the center of the cosmos. But are you? And if not, where is the center of the universe? One way to think about this is to imagine a two-dimensional ant that lives on the surface of a perfectly spherical balloon. From the ant's point of view, everywhere on the surface looks the same. There is no center on the sphere's surface, nor is there an edge. If you inflate the balloon, the ant will see its two-dimensional universe expand. Draw dots on the surface, and they will move away from one another, just like the galaxies in our real universe do. For the ant in this two-dimensional universe, any third dimension that extends perpendicular to the balloon's surface – like traveling into the center of the balloon – has no physical meaning. "It knows it can go forward and backward. It can go left and right," said Barbara Ryden, an astrophysicist at The Ohio State University. "But it has no concept of up and down." Our universe is a 3D version of the ant's 2D balloon universe. But the balloon analogy, with its limited surface area, represents a finite universe — which cosmologists still aren't sure is true of our own, Ryden said. Limited by how far light has traveled since the Big Bang, cosmologists' observations offer only a finite glimpse of the cosmos, but the entire universe could be infinite. If that's the case, then you can replace the balloon with a flat, expanding rubber sheet that extends forever. Or if you want to think of a 3D universe, imagine an infinite loaf of raisin bread that's continuously expanding. The raisins, in this case, represent the galaxies flying away from one another. "If the universe is infinite," Ryden told Live Science, "there is no center." Whether the universe is flat or curved depends on the total amount of mass and energy in the cosmos. 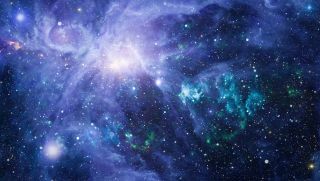 If the mass and energy density of the universe is just right — at the so-called critical density — then the universe would be flat like a sheet, expanding at a steadily accelerating rate. But if the density is higher, then the cosmos would be curved like the balloon. The extra gravity from this increased density would slow cosmic expansion, eventually bringing that growth to a halt. Meanwhile, at less than this critical density, cosmic expansion would accelerate even more. In this scenario, the universe would have negative curvature, with a shape somewhat like a saddle. It would still be infinite, however, and thus without a center. So far, theoretical ideas and observations — such as those of the cosmic microwave background radiation, the afterglow from the Big Bang — point to a remarkably flat universe. But cosmologists still aren't sure if the universe is indeed flat or if the curvature is so wide that the universe only appears flat — similar to how Earth feels flat on the surface. That the universe has no center — and, by extension, no edge — is consistent with the cosmological principle, the idea that no place in the universe is special. Observations of how galaxy clusters are distributed and the cosmic microwave background reveal a cosmos that, when you zoom out far enough, does indeed look the same everywhere. Throughout history, humans have wrongly thought we were at or near the center of the universe —whether that center was the Earth, the sun or even the Milky Way galaxy. But no matter how special we humans think we are, the universe has, so far, shown otherwise.